(Newser) – With a NASA spacecraft closing in on the dwarf planet Ceres, scientists were looking forward to figuring out the origins of a mysterious bright spot. But it turns out there are actually two bright spots, right next to each other, reports Mashable. The best guess continues to be ice of some kind, and NASA hopes to know for sure after the Dawn spacecraft enters Ceres' orbit on March 6. Once there, it will swoop as low as 232 miles above the surface as it maps the dwarf planet—and produces sharper images of those bright spots. 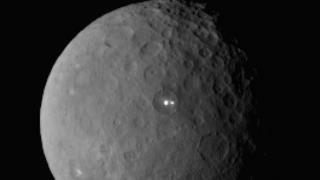 Bright Spots On Ceres ?!? Well, they're certainly not timelordriversong and Verteran_Joe ! ! ! I hope it's not a Distress Signal! Like in the Movie "ALIEN(1979) Excellent by far! Or we will be in a lot of DOO DOO!! There ya go ALL!! I think it's 2 buildings.